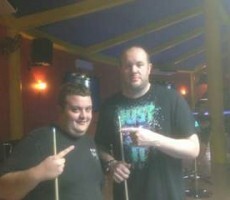 TUESDAY 10 BALL GRAND FINAL : MIKY IS CHAMPION. 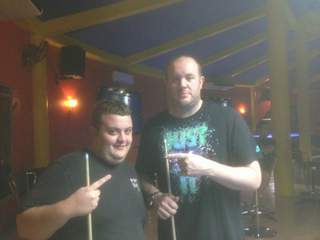 Congratulations go to Miky Mazza (A) from Italy for winning our Tuesday 10 Ball Grand Final for Season 11 on Saturday night. As the lowest handicapped player amongst the field of 16 entries, many considered Miky to have only a small chance of winning the event, but he proved them all wrong by playing superbly all evening to claim victory. He remained undefeated throughout the competition, winning 5 consecutive matches, and was a deserved winner. 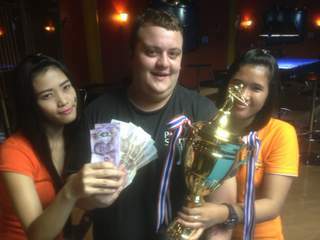 In the final he comfortably defeated Scott Cooney (A+20) from England, 2-6 in racks (race 2-15), to lift the trophy and collect the 1st prize of 10,500 baht. His handicap now moves up to A+ as a result. 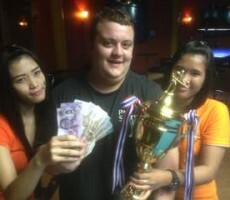 Scott received the Runners-Up prize of 5000 baht. Tom Fossum (A+10) from Norway and Yu Fluke Birman (A+5) from Brazil both played well to reach the semi-finals, taking home 3000 baht each. The other money winners on the evening were Preecha (A+18) from Thailand, John Yaron Weber (A+2) from Israel, Thomas Pettersson (A+1) from Sweden, and Hannu Torpstrom (A+!) from Finland, who all received 1500 baht as losing quarter-finalists.